The Requisition Technician looked at furnace today. I supposed that’s redundant since it’s winter and he is a furnace repairman. Anyway, Req Tech jiggled some wires and the furnace started working. RT then said that it would take a lot of work to dig into the furnace and figure out what was really going on, so he didn’t dig. Instead the homeowner dug into his pocket for $100 and handed it to RT who then left. The furnace stopped working again a half hour later. I looked at the same furnace this evening. 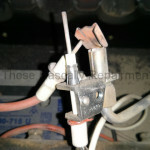 The wire Req Tech wiggled was the orange spark plug wire pictured below. The electrode it’s attached to had come loose, so it didn’t have proper gap. 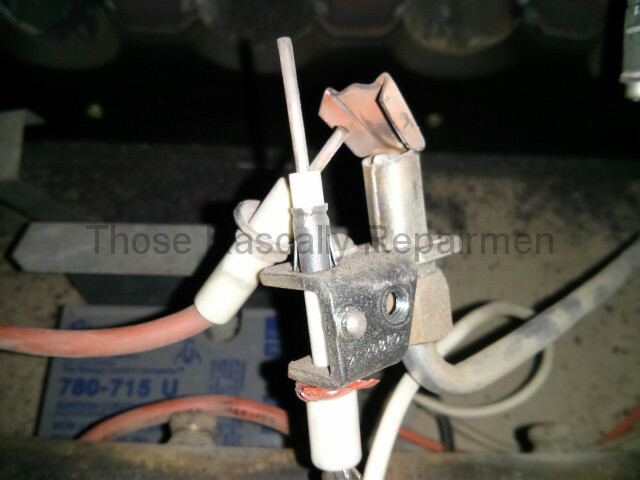 Just like a car’s spark plug, old furnace’s that have spark ignition need proper gap. It took me a half hour to replace the damaged electrode and restore the gap. Some much for the big dig. And so much for the homeowner’s $100.